Campo Kumeyaay Nation | Chairman Henry Paul Cuero, Jr.
Chairman Cuero, fondly called “Junior” by friends and relatives, is a successful cultural and tribal leader. He played a crucial role in drafting, analyzing and refining the California Native American Graves Protection and Repatriation Act (NAGPRA). He is knowledgeable of cultural program design development and management functions, his work with tribal youth in Southern California helps maintain the traditions of the Kumeyaay and other Tipai American Indian cultures. A traditional Bird Singer for over thirty years, Chairman Cuero and a group of Kumeyaay youth were invited to perform cultural Birdsongs with the San Diego Symphony Orchestra in a composition which bridged the gap between ancient and new cultures. Chairman Cuero was chosen to open the pre-game ceremony with Bird Songs at the 1998 Super Bowl in San Diego, California, as well as singing Bird Songs at the opening of the Smithsonian National Museum of the American Indian. Chairman Cuero was chosen to open the pre-game ceremony with Bird Songs at the 1998 Super Bowl in San Diego, California, as well as singing Bird Songs at the opening of the Smithsonian National Museum of the American Indian. Most memorable and probably the only time in history, Chairman Cuero and other Bird Singers were invited by President Clinton to sing at the White House. 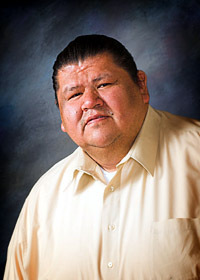 Since the age of nineteen, he has been involved in many aspects of governmental process including serving as Treasurer, Campo Kumeyaay Nation; President, Muht-hei, Inc.; Chairman, Campo Tribal Housing Authority; Chairman, Tribal Enrollment; Chairman, Campo Repatriation Committee and Vice-Spokesman for the Kumeyaay Cultural Repatriation Committee. His current community commitments include being Chairman of Campo Kumeyaay Nation; Board Member, Muht-hei, Inc., a Tribal Economic Development Corporation; Commissioner, California Native American Repatriation Oversight Commission; Director of Cultural Programs; Traditional Peon Tournament Director and Coordinator of New Kumeyaay Bird Singers and Dancers for Tribal Youth Groups. Chairman Harry Paul Cuero, Jr. is respected by other tribal leaders, tribal and community members, and most importantly the youth, for his personal traits and values that include patience, confidence and commitment to serving his community.